Home » Blog » Haveil Havalim #212: How Many Days til We Can Eat Bread? Haveil Havalim #212: How Many Days til We Can Eat Bread? There’s a whole community of Jewish bloggers out there, who regularly comment on… well,… everything. 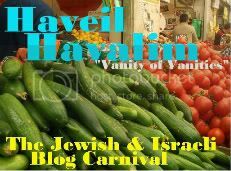 So check out this week’s Haveil Havalim over at Shtetl Fabulous, and find out what’s new in the Jewish blogsphere. Thanks for the cross-post! I really must work on my HH/blog carnival etiquette.